Thanks for these links, Peter. "You Won't Be Satisfied" is a good example of the difference tempo can make in a song. Unlike this live rendition of it, the Brown-Day recording was more of a jump tune -- done in a faster tempo. The recorded version charted at #4, and it's easy to see why. 1950 U.S. Treasury Bond Independence Drive Show, hope to find a recording of it too. Thanks for sharing this link, Peter. Came across some interesting short reports in a few old weekly issues of Variety magazine. The first was an ad dated Feb. 26, 1941 announcing that the Les Brown band was playing at Mike Todd's theatre in Chicago and would be there for an indefinite engagement. Then this, dated Sept. 1, 1943: "Doris Day, Cincinnati warbler, is hospitalized and mending from an emergency appendectomy which she underwent on August 24." The March 1, 1944 issue reported that "Doris Day rejoins Les Brown's band." 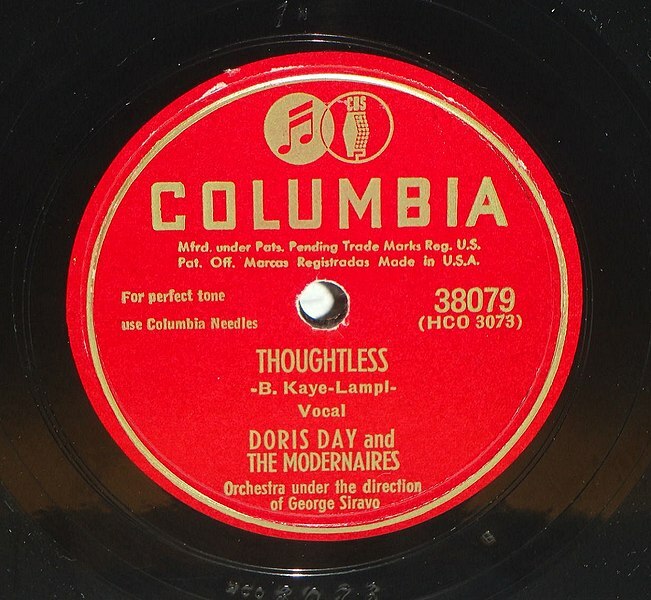 A note in a July 1944 issue indicated that Doris sang "Out of Nowhere" and "Swingin' on a Star." Finally, a review dated Dec. 20, 1944 of the band's engagement at the Cafe Rouge in the Hotel Pennsylvania, New York, noted the "excellent vocals by the shapely and photogenic Doris Day." Thanks for the new information, hope this leads to new discoveries... There are a lot different radio transcriptions stored around in America on 78's, 10'' inch or 16'' inch records but not many people are now into Doris, Les Brown or Bob Hope music/programs for making them available it seems. Hope this will change. Love to hear some reply's... And yes the audio is bad. It's sort of odd that "Do Nothing 'Til You Hear From Me" is on a country music website because it was strictly a jazz number, one of Duke Ellington's compositions. Just goes to show that things can be found in the most unlikely places! June Christy and Billie Holiday do great versions of this song. It was June's version that I first discovered- fabulous. The sound quality is sometimes not so well. What a neat find, Bryan. Hard to believe that Doris recorded it almost 7 decades ago, right at the very end of 1947. I like her vocal, but am not crazy about the Modernaires' contribution to the recording. Thanks for pointing this song out. Have heard it, and added the link below. Thanks, Judy (agree about Modernaires!) and Peter. What a sweet song, beautifully sung by Doris. I saw 1948 - her Warner Bros start year, so she was still recording separately from filmmaking? Yes, she began her solo recording career in February, 1947, a few months prior to the start of filming ROTHS. Several of her singles had already been released before the public saw her first movie. Among them were "It Takes Time," "My Young and Foolish Heart," the popular "Chocolate Sundae on a Saturday Night," and a great cover of Peggy Lee's torch song "Just an Old Love of Mine." We never talk much about The Bob Hope radio shows. (I like listening too them, I'm trying to find/collect as much as possible.) But I've tried to make a list of songs know to have been heard there. Hope to make an audio list on Box.net soon. The songs with the *** aren't available. Found out that most of the songs used, were songs Doris recorded a few weeks before. And there are some promoting Bob's films. Peter, you've compiled a really good list. Maybe you have a way to verify a couple of items in my notes that you might find of use. One is that Doris sang "If You Will Marry Me" on the same date she and Hope did a duet of "You Was." Also, my notes show that on 5-31-49 she sang "I'm Having a Wonderful Wish," as well as the song you listed on that date.